Sister Rosa Alvarez, one of three Carmelite nuns to come to Sussex County in the 1990s to begin an outreach ministry to the Guatemalan community, died Feb. 27 in Washington, D.C. She was 89. 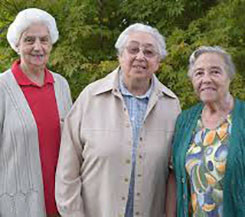 Sister Rosa and fellow Carmelites, Sisters Ascencion Banegas and Maria Mairlot, founded the La Esperanza Center in Georgetown in the late 1990s. The center helps immigrants with issues such as housing and prenatal care, and it intervenes in cases of domestic abuse. “Her holiness showed in her cheerful, welcoming, patient, non-judgmental manner. I think no one ever came from her presence without feeling they mattered,” said Father John Hynes, pastor of St. Catherine of Siena Parish in Wilmington. The three sisters retired in 2017. Sister Rosa returned to Washington, D.C., where she had ministered before coming to Delaware. Sister Ascencion died in January in her native Spain. According to her religious community, Sister Rosa was tireless and generous. She was known for her culinary abilities and loved to feed others. She is survived by her religious community, two biological sisters, nieces and nephews.